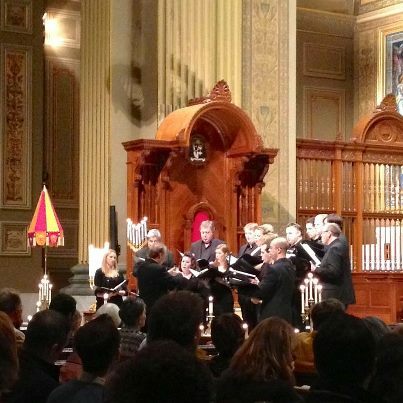 The 2012-13 season of “Concerts at the Cathedral Basilica” continued Friday, November 9, with the London-based Tenebrae Choir singing a program of mostly Russian Orthodox sacred choral music. 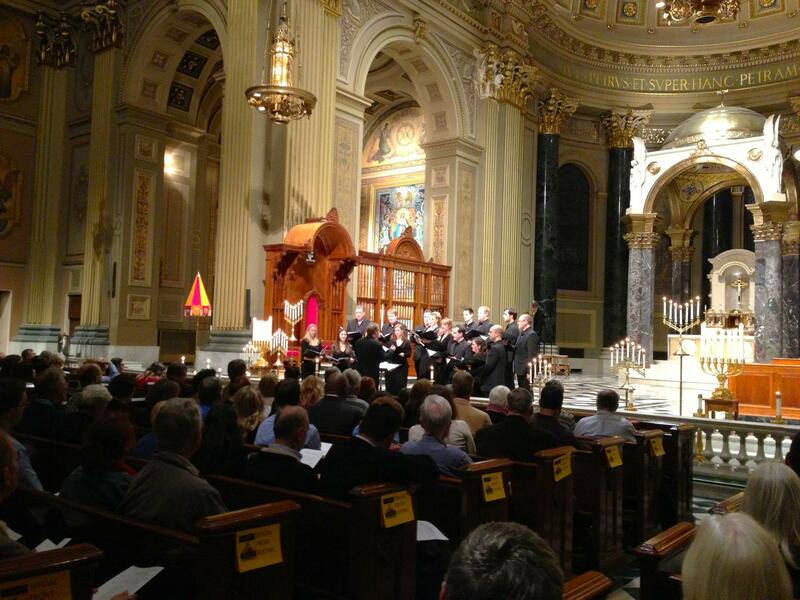 The concert took place in the Roman Catholic Cathedral Basilica of SS. Peter & Paul on the Benjamin Franklin Parkway in center city Philadelphia and drew an audience of nearly 1,000 music lovers, probably twice the size of the crowd that heard Tenebrae last season. Nigel Short conducted the 17-member choir in mostly unaccompanied music only rarely heard outside the confines of the great cathedrals of the Russian Orthodox Church, the largest and most influential of all the several Orthodox Christian Churches in the world and the second largest of all Christian Churches. Only the Roman Catholic Church lays claim to more members as well as an even more illustrious tradition of music in its liturgies. While most American classical music lovers think first and foremost of the piano whenever they hear or read the name of Sergei Rachmaninoff, the Russian master, himself, considered his piano music lesser in import than his orchestral music and those works of lesser importance than his sacred choral music. His “All-Night Vigil” and “Liturgy of St. John Chrysostom” are among the treasures of not just the sacred choral music of the Russian Orthodox Church, but of all sacred choral music composed for any and all liturgies. Rachmaninoff set the Old Church Slavonic texts with a profound understanding of the mystical spirituality that typifies the theological traditions of Eastern Orthodoxy. He manifested his inner discernment through melodies, harmonies and textures that regularly proffer tonal shadows that open up into rays of sonic sunshine at their resolutions. Shorter works by Pavel Chesnokov, Vasily Kalinnikov, Nikolay Kedrov and the ever-popular Pyotr Ilyich Tchaikovsky surrounded the Rachmaninoff scores with complimentary enhancement, offering the audience the full spectrum of Romantic Russian music for the Orthodox Church. Nigel Short added variety to the roster of works by including music by the Estonian Arvo Part’s “The Beatitudes” and several exquisite scores by the contemporary Englishman, Paul Mealor. Whereas “The Beatitudes” marks out a midway point between Eastern and Western styles of sacred choral music, Mealor staked out a different aural quality between his English and Latin language scores. While the English works were sweetly intimate in nature, the Latin scores were boldly chiseled in their presentation. It was, in short, one of the most satisfying programs of choral music I’ve heard as a music critic since I began working in 1976. The Tenebrae Choir sang every single work on their daunting two-hour concert with technical mastery and interpretive conviction. All 17 voices blended immaculately, yet whenever an individual singer sang a solo within a particular work, his or her voice blossomed with stentorian power. This was especially true in the Rachmaninoff works where one luxuriated in the resonance of true bass voices. Pitch was flawlessly maintained. Dynamics were incredibly varied from the most powerful fortissimos to the most hushed pianissimos. Diction was darkly hued in the Russian repertoire, delicately molded in the English, and crisply forward in the Latin. Through it all, Nigel Short conducted with a deft yet firm hand. He elicited superb singing through an unwavering focus on the holy texts that inspired the music. He shaped the phrases, balanced the counterpoint, and delineated the structure of each work as though he had composed it, himself. I hasten to mention the important ingredient of the venue. 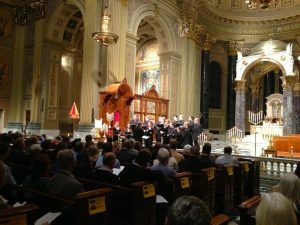 Although the Cathedral Basilica is in desperate need of restoration, there’s nothing wrong with its acoustics for programs such as this. The tones emanated from the choir and then rolled outward and then back again to surround the audience with the roseate sound of heavenly singing.